Railroading is an industry of poetry as well as prose. The prose is in the engineering, mechanics and technology that makes everything work. But the poetry lies in the lived experience of these machines and systems working — in a sublime train ride or the thrill of watching the action trackside. I dare suggest that, while there is plenty to be intrigued with in the prosaic aspects of railroading, it is its poetic side that truly captivates us, that keeps us in or close to the industry. A pensive fellow passenger on an Amtrak Cascades train writes while taking in Boundary Bay en route to Vancouver, B.C. Photo by Malcolm Kenton. It is also the quest for the poetic aspect, as much as economics, that drives progress and innovation — that gets new lines built, new types of locomotives and rolling stock designed, etc. This is especially true in passenger railroading, where more than a mere bland, utilitarian conveyance from origin to destination is usually demanded. 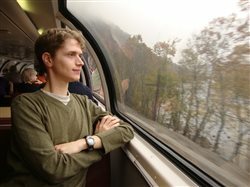 The unique pace and rhythm of train travel and the mode’s closeness to the landscape make for an atmosphere that fosters contemplation and conviviality. Sadly, imagination for what could be in the passenger realm — both for a robust, interconnected network and for all the ways trains can serve as a vehicle for conversation, meditation, exploration and collective imagination — is lacking in the United States. Those in positions of power or influence over transportation policy and passenger rail development must dare to put forward and push for big ideas. I am currently engrossed in The Power Broker, Robert Caro’s seminal biography of the public administrator, urban planner and “master builder” Robert Moses. Moses’ big ideas, combined with his drive and lust for power, led him and his acolytes to rebuild much of New York City and State’s built environment in the mid-20th century in pursuit of his automobile-centric (and tinged with racism and classism) utopian vision. Andy Warhol's tile portrait of Robert Moses at Flushing Meadows Park in Queens, N.Y. Photo by Stephen Dettling / Flickr.com. Moses can legitimately be blamed for the consequences of long-term underinvestment in transit in metropolitan New York that subway riders and rail commuters are currently suffering through. There was a lot of money at his disposal during the postwar boom that he could have used to modernize the rail transit system. Instead, he poured nearly all of it into concrete and asphalt instead of steel rail and crossties. Perhaps we need a cadre of modern-day Robert Moseses (but without the arrogance and condescension that characterized Moses) who can get things done for train and transit users the way Moses did for motorists. Of course, federal and state laws such as the National Environmental Policy Act were passed in the 1970s to prevent government bodies from wielding as much unbridled power as the ones Moses controlled did, and to provide that agencies must solicit and take into account citizen input when designing, approving and funding major infrastructure projects. These laws are necessary, but should excuse a lack of large-scale visionary thinking. A broad swath of the public and stakeholders should be involved in shaping our passenger train and transit future, and I am confident that a level of investment in these modes that can help them catch up to the level of development that highways are at is in line with what a solid majority of Americans, and of residents in each metropolitan region, desires. A downtown L.A.-bound Expo Line light rail train arrives at 26th Street/Bergamot station in Santa Monica, Calif. on Aug. 24, 2017. Photo by Malcolm Kenton. One region where an innovative and public communication-savvy transit agency and a supportive electorate is making some big things happen in rail transit is the one I am currently visiting: greater Los Angeles. Outside-the-box thinking and presentation of plans in a way that connects with lay residents — both riders and non-riders — is one of the hallmarks of the Los Angeles County Metropolitan Transit Authority. Of course California is economically and politically unique and Southern California’s traffic problems put it in a league of its own, but there are many lessons that other regions and their train and transit proponents could learn from the City of the Angels. Architect Daniel Burnham, who designed the union stations of Washington, Chicago and El Paso along with many other buildings, is famous for saying (and I paraphrase) that little plans lack the magic necessary to mobilize the collective effort needed to realize them. If those who plan, design and administer passenger rail in the US make only small plans, only small improvements will be made. The confluence of our overwhelmed highways and aviation system and of the unprecedented global challenge posed by climate change make ours a historic moment that calls for big plans and big undertakings for a transportation system that does a better job moving people and goods smoothly with a lower ecological impact.